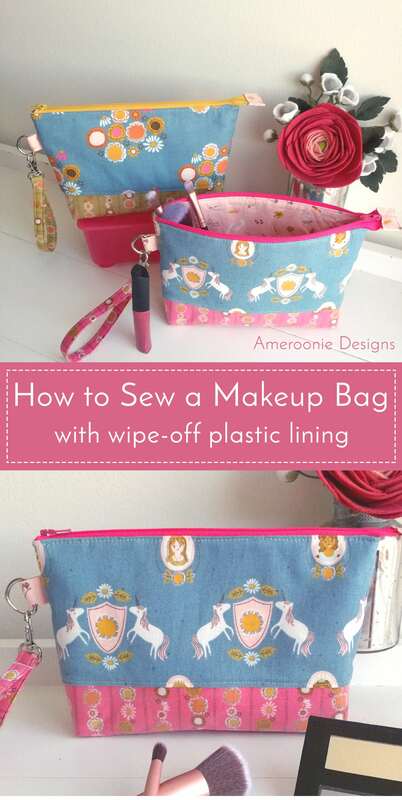 Amy from Ameroonie Designs wrote an adorable DIY Makeup Bag pattern to share with you today. 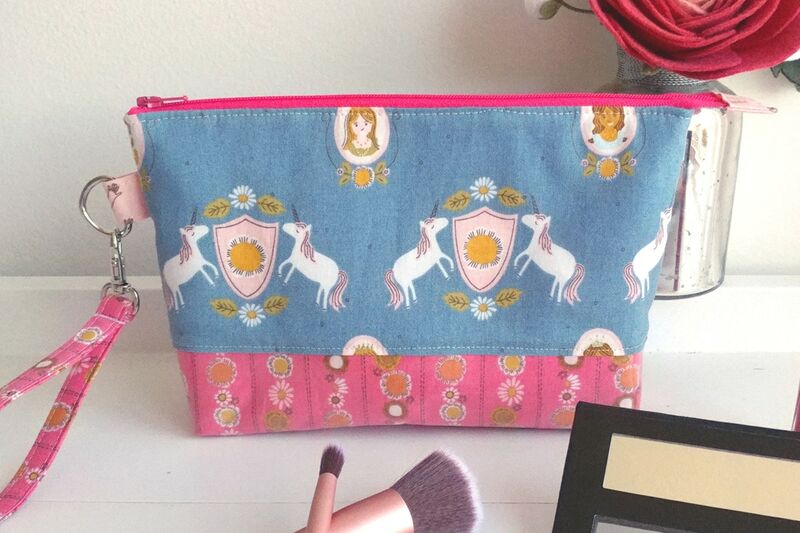 I LOVE making cosmetic and makeup bags, you can never have too many in my opinion. 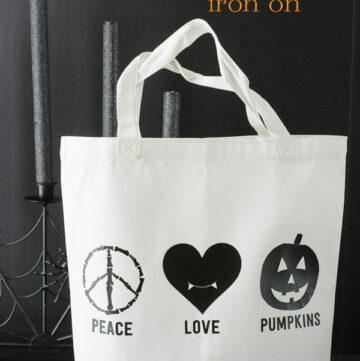 Plus they make great gifts for moms or girlfriends. 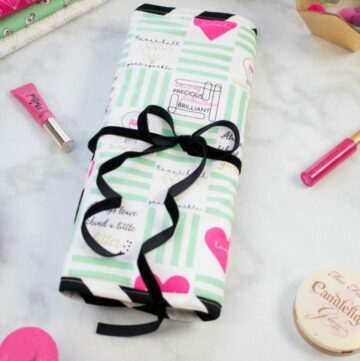 This makeup bag is extra useful because the interior wipes clean, thanks to the vinyl lining. 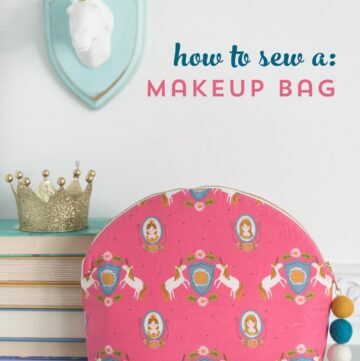 Keep reading to find out how to sew one! 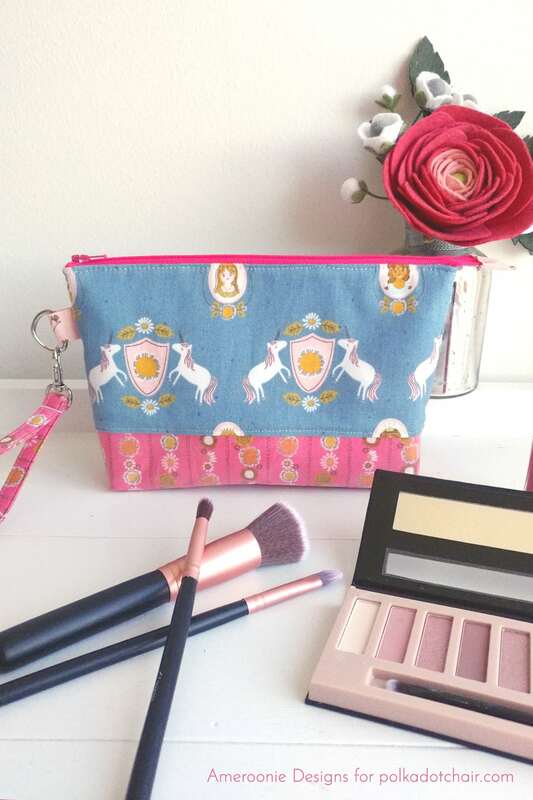 A makeup pouch is always nice to have around, to keep your things organized at home or on your travels. 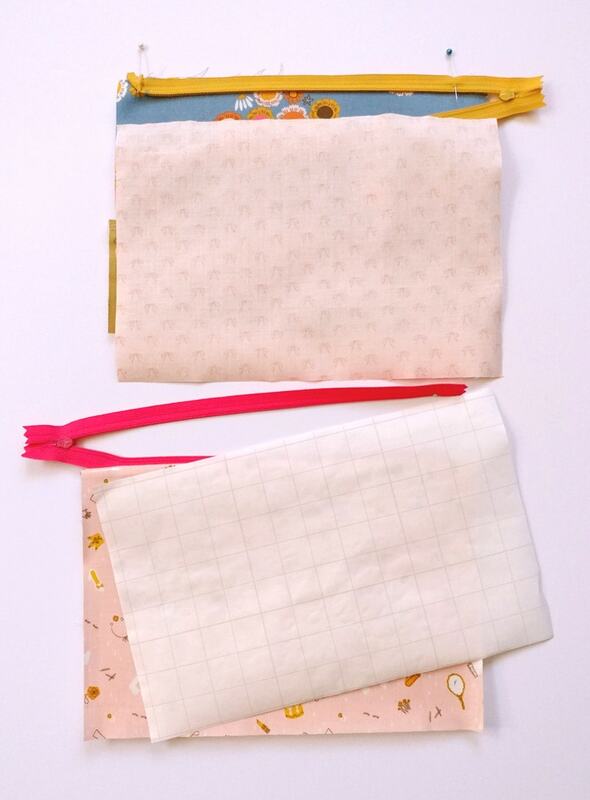 But, makeup can spill, and counters get dirty- so it’s nice to have a pouch that you can wipe clean! 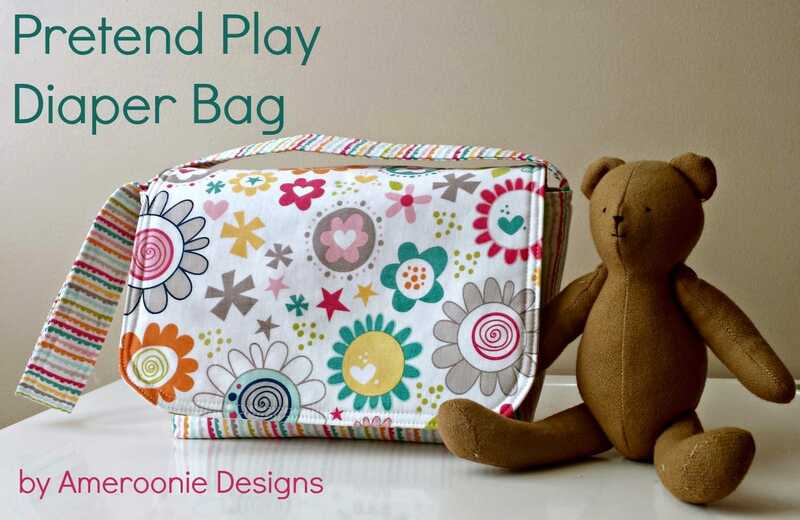 Using either laminated cotton, or creating your own vinyl coated fabric lets you create a wipeable interior and bottom to a makeup pouch that isn’t too small, and isn’t too big- it’s just the right size. Are you ready to make one for yourself? 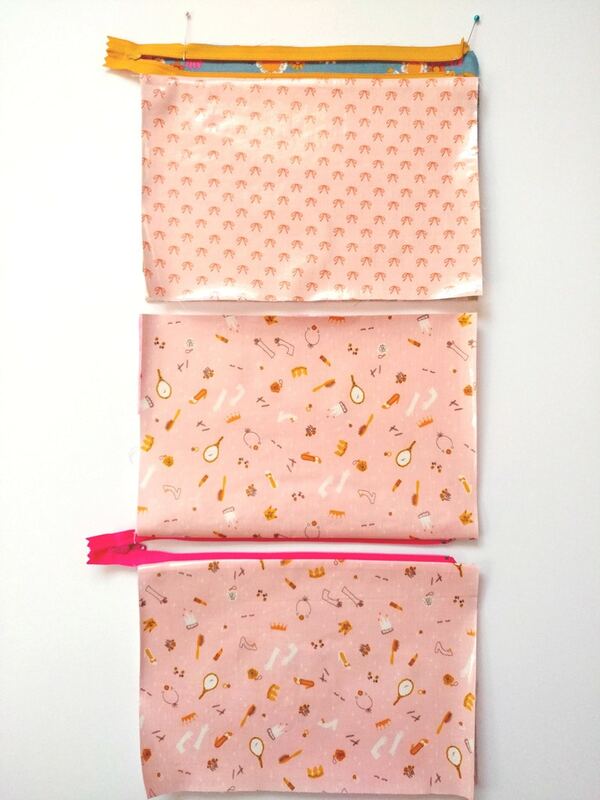 Note: In the following pictures I am making two different pouches, so the fabrics may vary from step to step. You will follow all the steps shown, regardless of the fabrics in the photo. *Note: I am including the steps needed if you are doing the iron on vinyl. Line up the top of the exterior bottom piece with the bottom of the Main exterior piece. 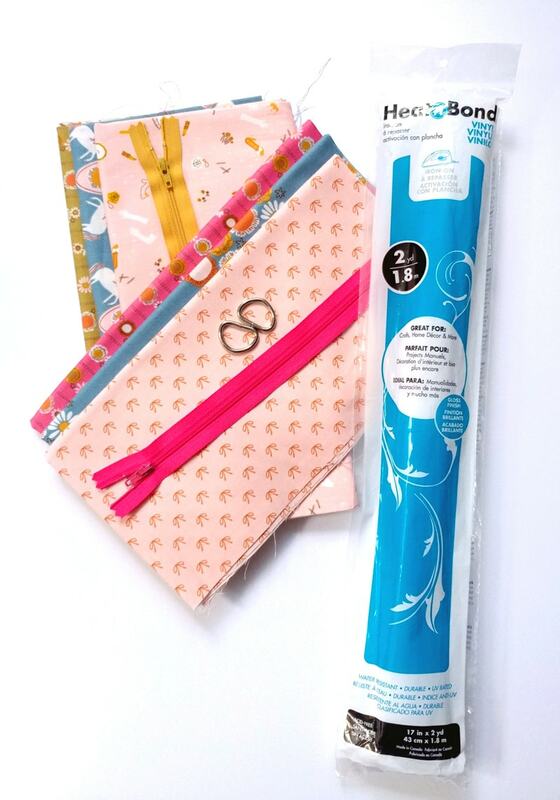 *TIP: coated fabrics do not heal from pin holes as easily as regular cotton fabrics do, so I recommend pinning within the seam allowance or using binding clips to hold pieces together. Sew together making sure to press the accent fabric away from the main fabric. *TIP: DO NOT touch your iron to the coated fabrics. 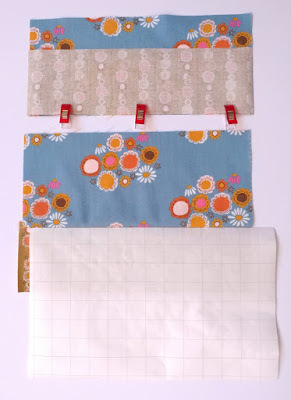 Use either the paper backing from the IOV or a press cloth to cover any coated fabrics when at the iron. 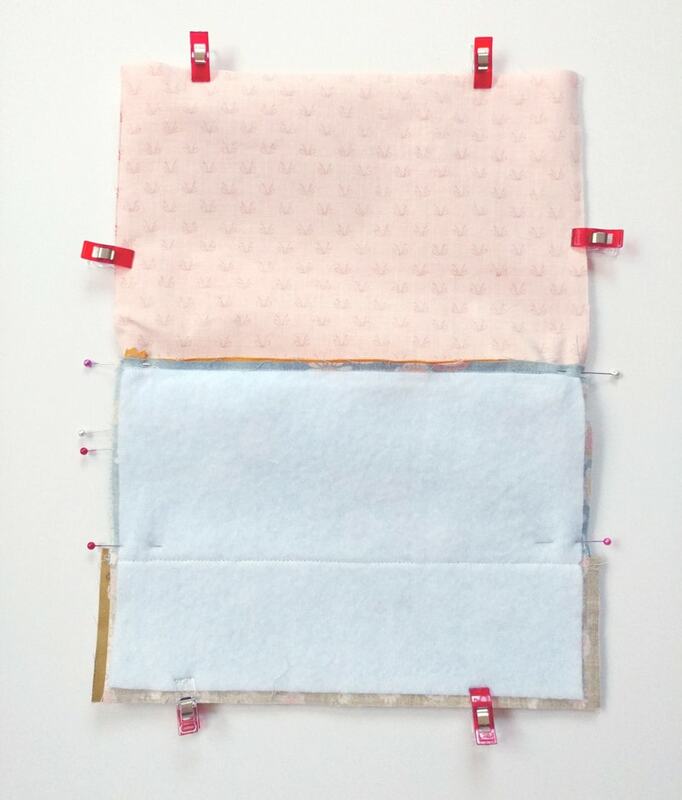 TIPS: If you are having trouble feeding your coated fabrics through your sewing machine here are a few tips for you. 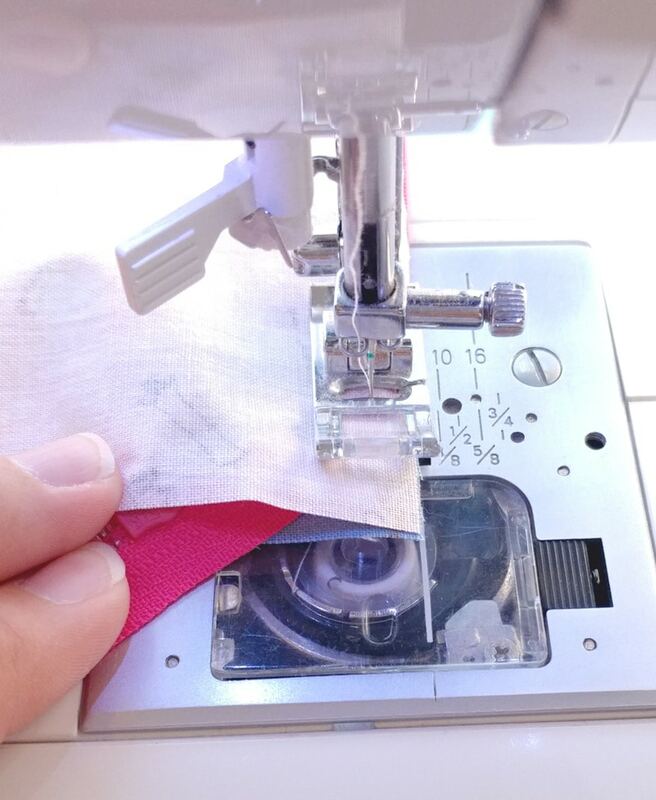 Increase the stitch length on your machine. Use a walking foot or teflon foot. If you don’t want to purchase a new foot, try covering the bottom of your presser foot with matte clear tape. Use a pin or sharp scissors to cut open the hole where the needle goes through. Coated fabrics seem to stretch a bit more than regular cotton as well, so try to have your coated fabrics on the bottom when feeding them in your machine if possible. Fuse the fleece to the back of both exterior pieces. Top stitch along the seam between the main and accent fabrics. Take your zipper and line it up, right side down, with the top of the front exterior piece. It’s easier to do this if the zipper is fully opened. At the free end of the zipper, (the left side) fold up the zipper tape outside of the metal stop so it is perpendicular to the zipper, pin in place. 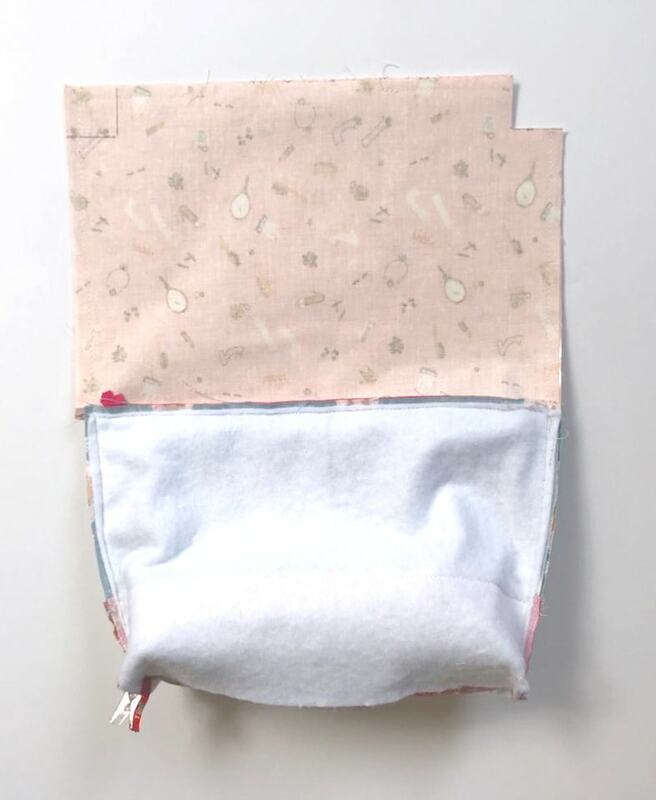 On the right side of the zipper, measure 1″ from the end of the exterior of the pouch and pin the zipper in place there. Place your lining, right side down, and line up all three pieces: the exterior, zipper and lining. Sew along this edge until you reach the pin 1″ from the edge of the fabric. (You may choose to use a zipper foot at this point, but I usually don’t). With the needle in the down position, lift up the presser foot. Pull the loose end of the zipper away from the line you are stitching toward the inside of the fabrics you are sewing. Put the presser foot down and sew the fabrics together, keeping the zipper out of the seam. Press both pieces of fabric away from the zipper. 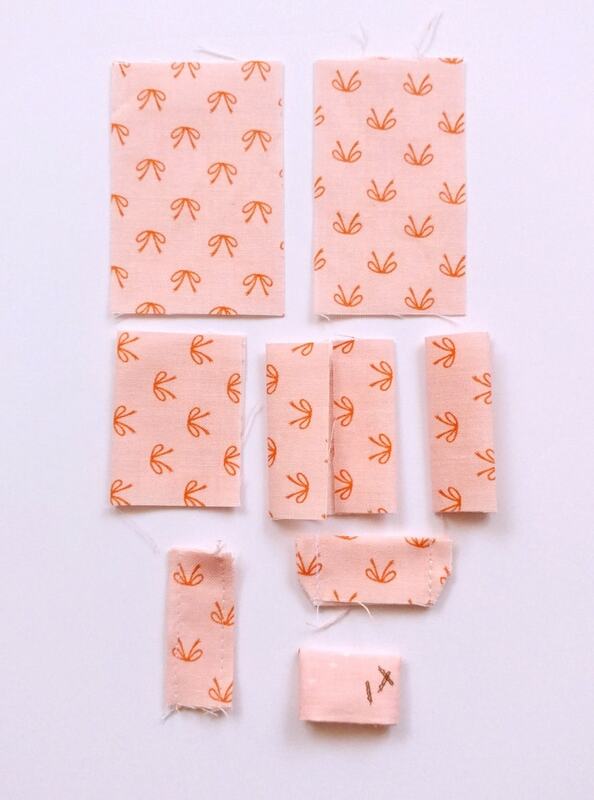 Attach the fabrics to the second side of the zipper in the same manner as the first side. Just make sure the metal tabs on the loose ends of the zipper line up. I line up the sides of the exterior pieces and then make sure the zipper is positioned so the metal tabs line up before I begin pinning the zipper down. Again, press the fabrics away from the zipper. 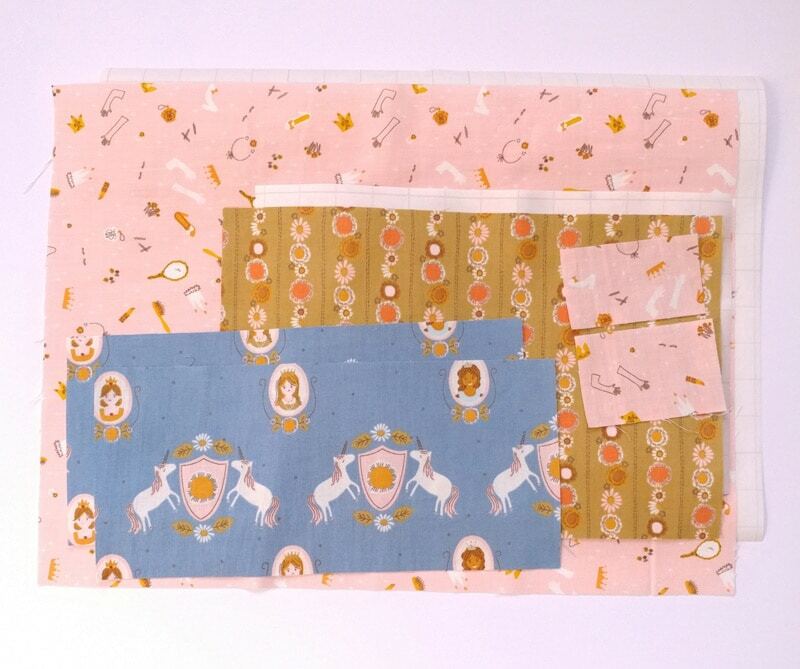 Take your two small 3″ long pieces to the ironing board and press in half along the 3″ length. Open up this crease and bring the raw edges into the middle to meet at the crease, press. Fold up the original crease to enclose the raw edges. 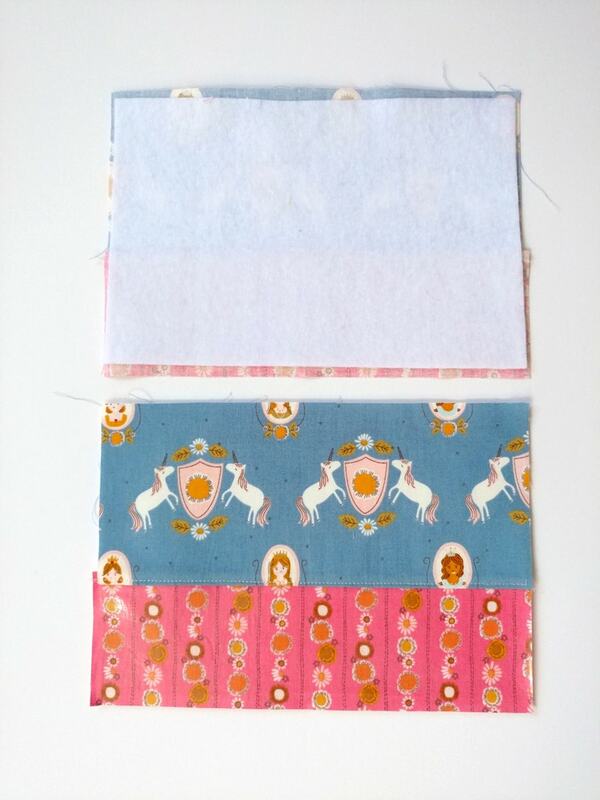 ON the 2″ piece: sew along both 2″ edges using an edge stitch. Place your pouch with the exterior facing up. Close the zipper about 1/4 of the way. Fold the lining of the front piece up and away from the exterior front piece. Pin the loose end of the zipper against the front piece to keep it from getting caught in the seams while assembling. Take the 2″ piece from the previous step and fold it around the d-ring. Pin in place 1″ down from the zipper on the side opposite the free end of the zipper. Fold down the back exterior piece and begin lining up the edges. Make sure the seam allowances from the zipper are pinned toward the lining. Sew around all 4 edges, leaving an opening in the bottom of the lining for turning. Mark 1″ squares on all 4 corners. Cut out the squares. Pull out the edges of the corners and line up the seams to create a straight line. Sew along this line with 1/4″ seam allowance to box the corners. Turn the pouch right side out through the opening in the lining. TIPS: remove the pin holding the free end of the zipper first! You’ll thank me later! Fold under the seam allowances of the opening and sew them shut with an edge stitch. 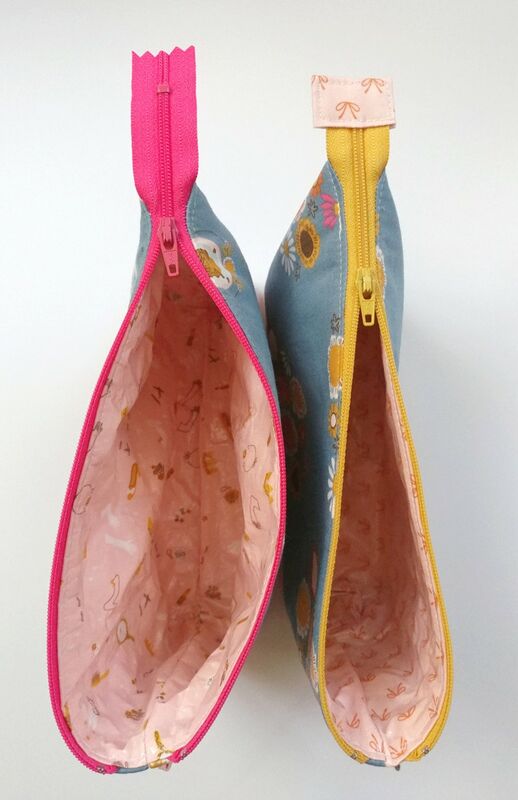 Push the lining to the inside of the cosmetic bag. Press fabric away from the zipper again. Top stitch around the top of the cosmetic bag. 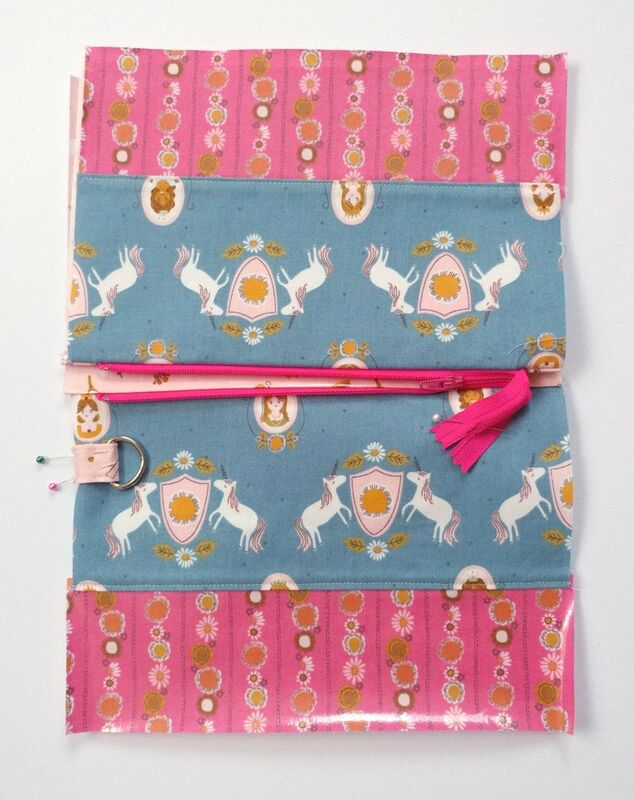 Trim the loose end of the zipper so it is just over 1″ away from the edge of the pouch. If using a 9″ zipper, I trim just under the metal stop. Slide the tab made from the 1 3/4″ piece of fabric over the end of the zipper. I put the zipper on top of the seam allowance. Sew around all 4 sides of the tab. Do one final press of the pouch. TIP: DO NOT press the outside of the makeup bag with the two lining pieces touching. This will only glue your lining pieces together as the plastic will melt to the plastic on the other side. When you press make sure you’re only pressing the front or the back of the bag. Not both! 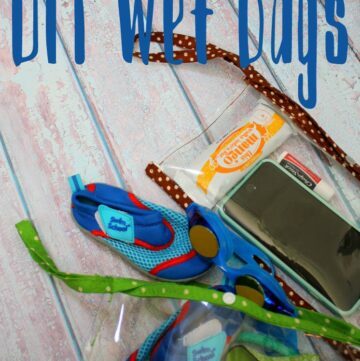 Now you have a pouch you can take anywhere without worrying about what might happen. 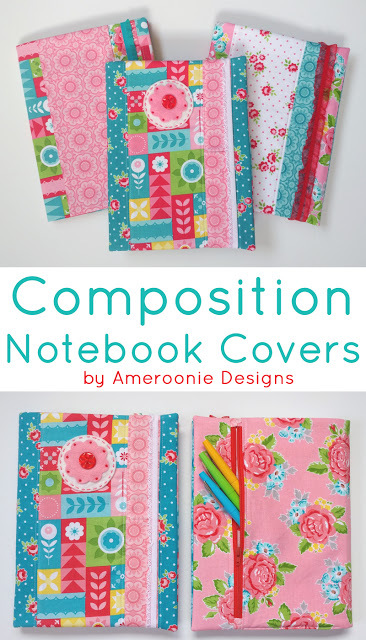 If you have enjoyed this tutorial- I hope you’ll come over to my blog Ameroonie Designs and see what other projects I have for you! Hi! 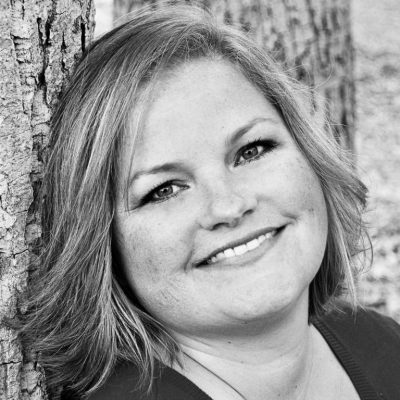 My name is Amy Chappell and I blog over at Ameroonie Designs. I currently live in Utah with my husband and 6 kids. 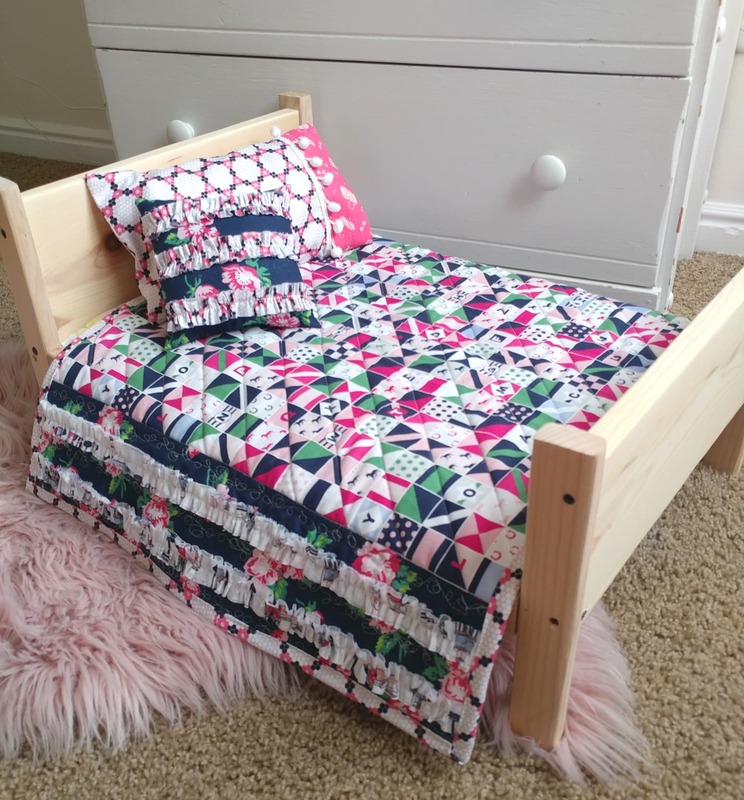 I love being a mom but needed an outlet that would give me something to do that stayed done, enter sewing and creating. Love the satisfaction of taking fabric and ideas and making something new. 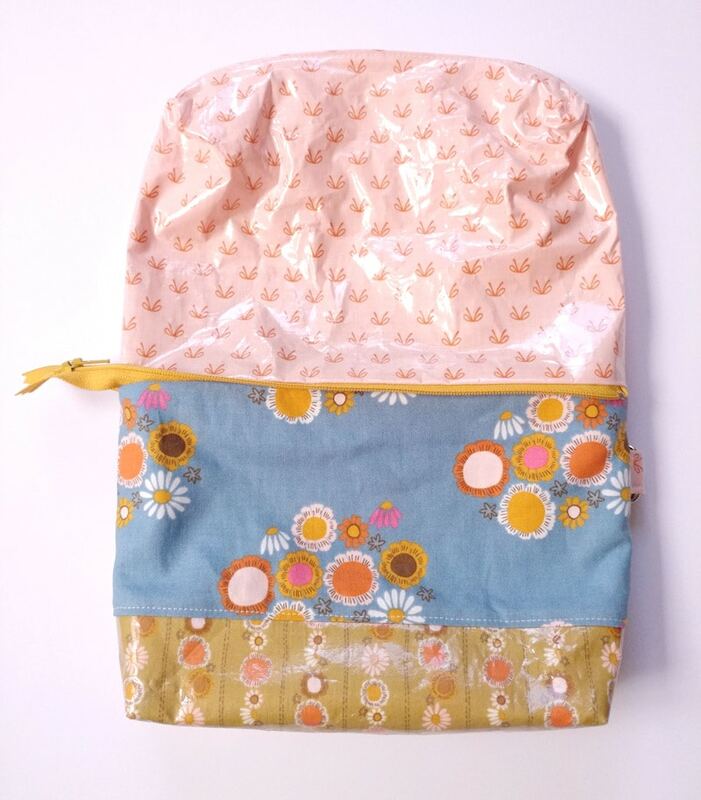 I also love that blogging has given me a way to meet new people and find a community of amazing people who love fabric and sewing as much as I do. 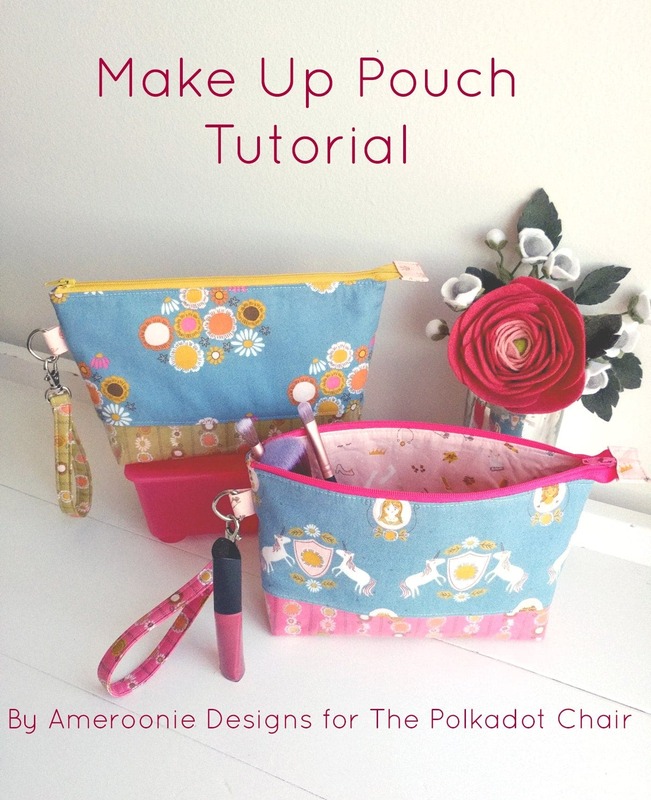 How to Make a Pom Pom Zipper Pull.